Captain Toad: Treasure Tracker reaches Switch and 3DS in July. With both new versions just a few weeks out, Digital Foundry is taking a closer look to see how they stack up from a technical standpoint. Originally, Captain Toad: Treasure Tracker ran at 720p on Wii U. This has been increased to 1080p on Switch when docked. It’s a native 720p in handheld mode. 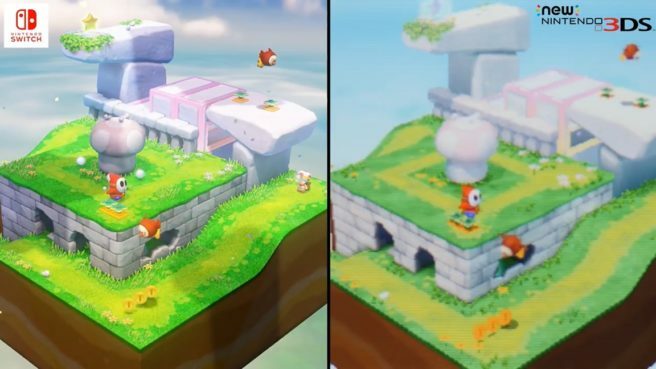 Captain Toad: Treasure Tracker is essentially identical on Switch compared to Wii U in terms of visuals. User graphics display at 1080p though. The 3DS version is where things get interesting. Nintendo is displaying the same action on both screens, meaning the action is being rendered twice. There is naturally a downgrade in visuals, affecting texture detail, shader quality, and geometry are reduced. When playing on Switch and 3DS, Captain Toad: Treasure Tracker runs at 60 frames per second. The 3DS version drops that to 30 FPS.